This document explains the relationship between p-value and confidence intervals. It goes on with the specific case of a binamial law. Assuming we want to determine whether or not two binomial laws are significantly different, how many observations we need to get the p-value under a given threshold. The term p-value is very popular in the world of search engines. I usually prefer confidence interval 95%, I think it is easier to understand. Plus, because p-Value are real values, we could be tempted to compare them and it is usually wrong. On the other hand, it is more difficult to compare confidence intervals, especially if they are related to complete different variables. Their nature prevents you from doing that. Howerver p-Values and confidence interval are similar: they tell you whether or not a metric difference is significant. Not all of them have a standard deviation. For example, if follows a Cauchy law, which does not exist. This remark also concerns every distribution known as heavy tail distribution. With confidence intervals, you first choose a confidence level and then you get an interval. You then check if your value is inside or outside your interval. Inside, the gain is not significant, outside, it is. At this point, we should not forget that we use a theorem which tells us that when , which means everything we said is true when is great enough. Usually, we do not want to test if an average is null but if the difference between two averages is null. 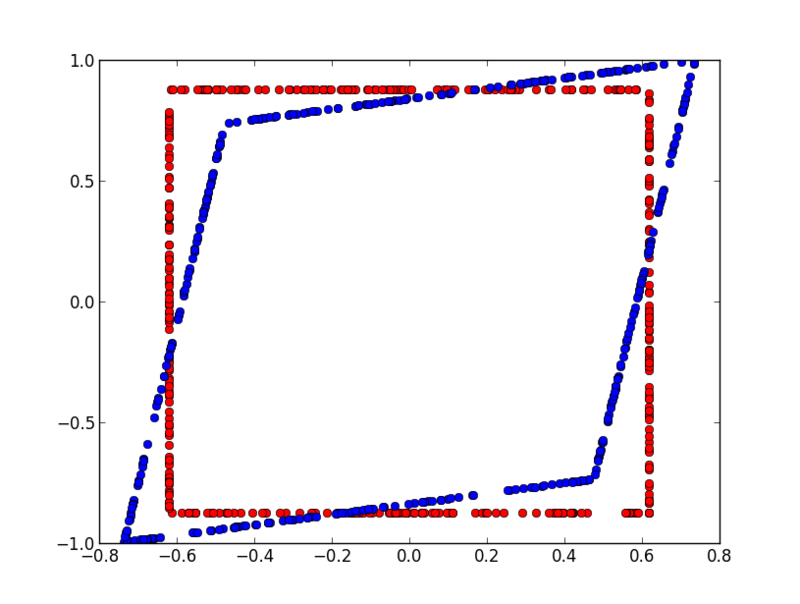 We consider two random samples having the same size, each of them described by and . All variables are independant. are distributed according the same law, we assume the same for . We expect the following difference to be null. Assuming every follows a normal law . Let’s assume we now have a vector a correlated variables drawn following a law . We consider . We then have and where is the identity matrix. We could now consider each dimension of independently as illustrated in next figure: it shows the difference on an example if we consider the correlation of two variables correlated such as . We assume we observe two Bernouilli variables correlated. Red points represents the area for which we would accept hypothesis H0 in case both variables are independant. Blue area represents the same but with the correlation. But that would not be the best way to do it. The confidence interval for a couple of indenpendant gaussian variables is an ellipse. Two independent normal variables with a null mean and standard deviation equal to one follows a law. Based on that, we can deduce a boundary for the confidence zone at 95%. 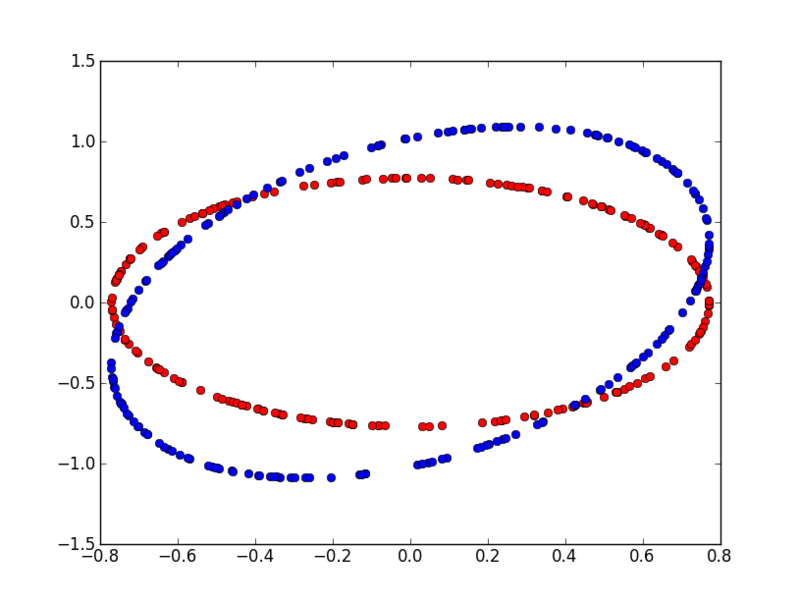 Next figure shows this zone for a non-correlated couple and a correlated couple ( ). We assume we observe two Bernouilli variables correlated. Red points represents the area for which we would accept hypothesis H0 in case both variables are independant. Blue area represents the same but with the correlation. The problem of Multiple comparisons happens when dealing with many metrics measyring a change. That’s allways the case when two version of the sam websire are compared in a test A/B. The metrics are correlated but it is unlikely that all metrics differences will be significant or not. The Holm–Bonferroni method proposes a way to define an hypthesis on the top of the existing ones. We here assume there are two populations mixed defined by random variable . Let’s be a mixture of two binomial laws of parameters and . It is for example the case for a series draws coming from two different coins. See also Applying the EM Algorithm: Binomial Mixtures. The following notebook produces the figures displayed in this document.